March 16, 2016 – Ninety years ago, on March 16, 1926, a rocket lifted off – not with a bang, but with a subtle, quiet flame – and forever changed the scope of scientific exploration. This event ties directly to the birth of NASA more than 30 years later. Less than a century ago, astronomers relied entirely on ground-based observations to further scientific study. Today, descendants of that first liquid-fueled rocket provide eyes on cosmic phenomena, unravel mysteries of the early universe, and even take a closer look at what makes our own planet tick. 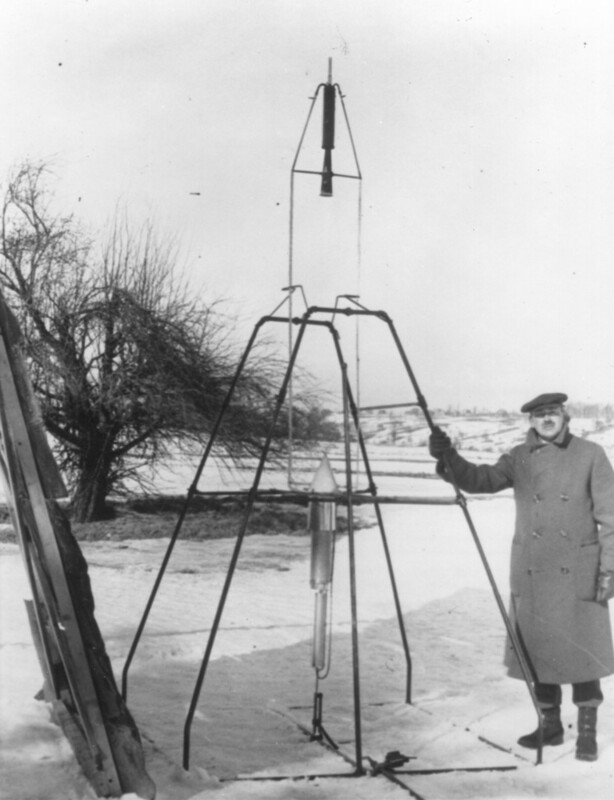 Prior to Goddard’s experimentation, rockets had not changed much in several centuries. Chinese engineers invented them as war machines in the 13th century, using solid gunpowder as fuel. But Goddard realized that liquid propellants offered a number of advantages over solid-fueled rockets. He began to test rockets fueled by liquid gasoline and liquid oxygen. The new design posed a number of challenges. For instance, he had to find a way to mix the fuel with oxygen. Otherwise it wouldn’t burn fast enough to produce the necessary thrust to lift the weight of the rocket. He also had to find a mechanical solution to pressurize the fuel chamber so it would continually feed fuel to the engine. Each solution he found brought with it a new challenge to solve. “It looked almost magical as it rose, without any appreciably greater noise or flame, as if it said, ‘I’ve been here long enough; I think I’ll be going somewhere else, if you don’t mind,'” Goddard wrote in his journal the next day. Most rockets today use liquid fuels because they provide more thrust per unit of fuel and they allow engineers to time how long the rocket will remain lit more precisely. For example, the United Launch Alliance Atlas V, on which many NASA missions launch – such as the Magnetospheric Multiscale Mission, which launched in 2015 – and the Ariane V, on which NASA’s James Webb Space Telescope will launch in 2018, both use liquid fuels in one or more of their stages. Over the course of his career, as well as posthumously, Goddard was awarded more than 200 patents for his inventions, many of which pertained to rocketry. These also included the invention of multistage rockets, which contain multiple fuel tanks and engine segments that can be jettisoned as they are emptied. Goddard’s work didn’t stop there. He continued to improve upon his rocket concepts until his death in 1945. The U.S. failed to recognize the full potential of his work until after his death – in fact, some of his ideas about reaching outer space were ridiculed during his lifetime. But the first liquid-fueled rocket flight was as significant to space exploration as the Wright brothers’ first flight was to air travel, and 90 years later, his patents are still integral to spaceflight technology.